This article is about the mother of Imam al-Sadiq (a). For his daughter, see Umm Farwa bt. al-Imam al-Sadiq (a). Umm Farwa (Arabic: اُمّ فروة) was Imam al-Baqir's (a) wife and mother of Imam al-Sadiq (a). She was the daughter of al-Qasim b. Muhammad b. Abi Bakr and her lineage also reaches Abu Bakr from her mother's side. Umm Farwa was a good woman who was praised by Imam al-Sadiq (a). She was also considered a narrator of hadith. Umm Farwa was the daughter of al-Qasim b. Muhammad b. Abi Bakr, Imam al-Baqir's (a) wife and mother of Imam al-Sadiq (a). Her father was al-Qasim who was trustworthy to Imam al-Sajjad (a) and his companion and was known as the faqih of the people of Hijaz. The name of Imam al-Sadiq's (a) mother was Fatima or Qariba and her kunya was Umm Farwa or Umm al-Qasim. Her mother was Asma', daughter of 'Abd al-Rahman b. Abi Bakr. Since Umm Farwa reached Abu Bakr from both his mother's side and his father's side, Imam al-Sadiq (a) has been called a grandson of Abu Bakr by Sunni people. They narrate a hadith from Imam al-Sadiq (a) saying, "Fathered me Abu Bakr twice" in which he (a) has twice called himself a child of Abu Bakr. Shi'a regard this narration forged and even taking the standards of Sunni people, it is not reliable. Among Shi'a sources, the above-mentioned narration has only been mentioned in Kashf al-ghumma and al-Irbili has narrated it as a mursal narration (whose chain of transmitters is broken) because al-Hafiz 'Abd al-'Aziz al-Janabidhi has narrated it directly from Imam al-Sadiq (a) while he died in 611/1214-1215 and Imam al-Sadiq (a) was martyred in 148/765-766. Moreover, this narration has not been mentioned in any other Shi'a sources. This narration has been narrated by al-Dhahabi without any reference and even with it has been mentioned in Tahdhib al-kamil with reference, in the chain of its transmitters, Hafs b. Ghiyath exists whose narrations have been considered unreliable. Ibn 'Asakir has also narrated this narration from a person called Isma'il b. Muhammad b. al-Fadl while al-Dhahabi says that when Ibn 'Asakir met Isma'il, he was very old and his memory was faulty. Besides, in the reference, Ibn 'Asakir has mentioned for this narration, Mu'adh b. al-Muthanna exists who is considered unjust by Ahmad b. Hanbal. About his mother, Imam al-Sadiq (a) said, "My mother was faithful, pious and good-doer and God loves good-doers." Al-Mas'udi considered her among most pious women of her time. Mamaqani described her a pious and good-doing woman. Merits of this woman were so much some called Imam al-Sadiq (a), "Ibn al-Mukarrama" (Son of the Great Woman). Al-Barqi regarded Umm Farwa among narrators of Imam al-Sadiq's (a) hadiths and al-Mas'udi says that she had narrated hadith from 'Ali b. al-Husayn (a). Also, Mamaqani testified to her trustworthiness. Imam al-Sadiq (a) said that, "my mother narrated a hadith from my father telling her, 'O Umm Farwa, I ask God a thousand times day and night to forgive the sins of my followers, because due to the knowledge we have about rewards, we tolerate about hardships and trials, while our followers tolerate without knowing about them.'" Umm Farwa had a maid called Sa'ida who was famous for her knowledge and worship. 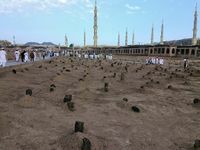 Umm Farwa is buried in al-Baqi' cemetery. The exact place of the grave is not known. The content of this article is mainly taken from ام فروة مادر امام صادق (ع) in Farsi WikiShia. This page was last edited on 26 December 2018, at 09:36.